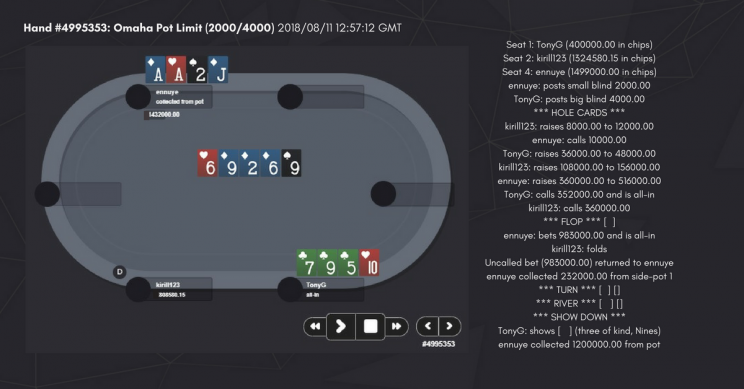 CoinPoker advisor and long-time poker pro Tony G hit our cash games hard last weekend, playing for pots in the millions with our cash game regulars. After noticing the demand from our players for bigger limit tables and more high-stakes action in our lobby, our team thought it was time to deliver. Pot Limit Omaha was the game of choice, and with limits set higher than ever the stakes were high enough without the crazy calls and raises we’ll be sharing below. Our team kicked off the games with 1,000/2,000 CHP limits, followed by 1,500/3,000 and ultimately 2,000/4,000 CHP. In case you missed out on the action, we put together the five biggest pots played for by Tony G and other high rollers in the sudden excitement. And as illustrious as Tony G’s poker career has been, quite of few of our own regulars gave him a run for his money. This hand starts with kirill123 raising pre-flop, followed by a series of re-raises that result in TonyG going all-in. kirill123 folds after the flop when ennuye goes all-in, leaving him with TonyG in a showdown holding a pair of Aces against a pair of 9s and a gutshot straight draw until he’s turned a flush that ultimately wins him the pot of 1.4 million CHP. TonyG, ennuye and kirill123 are seated at the table, but only kirill123 calls TonyG’s pre-flop raise of 7,500 CHP. After checking on the flop, kirill123 is faced with another bet from TonyG; this time for 22,500CHP. After calling again, the turn card gives kirill123 the third King. A series of raises and re-raises ensue until kirill123 goes all-in against Tony G’s three of a kind 4s, ultimately winning a 7-figure pot worth 1,666,500 CHP. 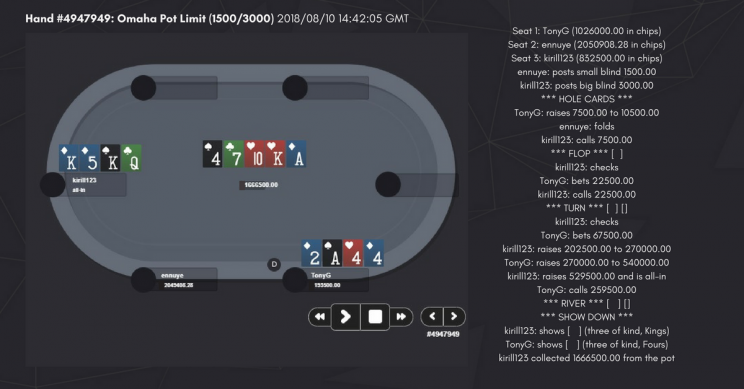 This hand kicked off with a bang as TonyG and kirill123 raised and reraised each other into a showdown before a single community card was dealt. 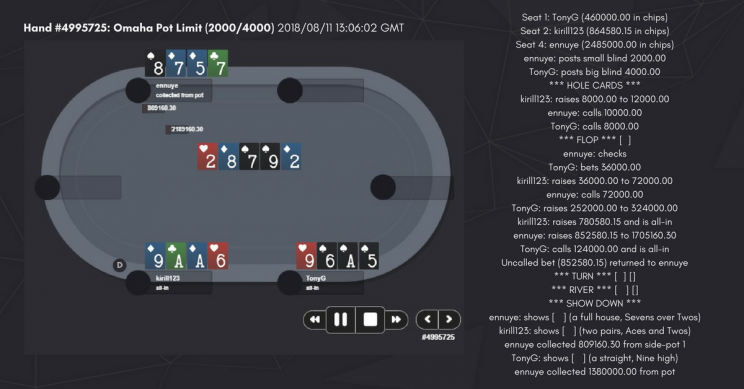 Ennuye opted out of the action after TonyG made the first raise, and the showdown ultimately led to kirill123 claiming nearly 2 million in CHP with a two pair of Kings and Aces against TonyG’s pair of 9s. Once again, the pre-flop round comes with raises. 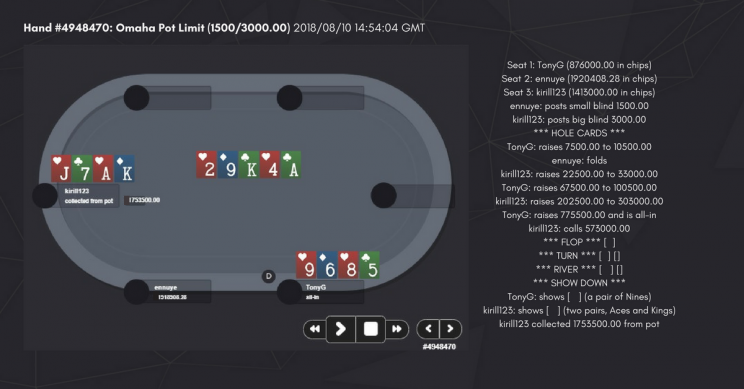 kirill123 folds as TonyG raises ennuye’s first bet, followed by yet another re-raise before the flop. After checking, TonyG faces a bet of 144,000 CHP, one that he eventually raises to the pot sized bet of 720,000CHP. 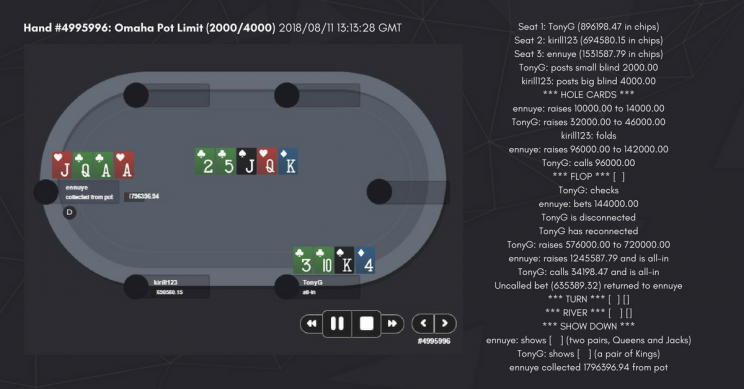 ennuye raises and goes all-in, at this point with a pair of Aces, a nut flush draw and a backdoor straight draw, while TonyG has a few outs with only a straight draw. The turn and river cards give TonyG the second king, but that’s not enough to beat ennuye’s queens and jacks and land him the 1,796,396 CHP on the table. All three players post BB pre-flop, but once the community cards are dealt the bets and raises pour in. Starting with TonyG’s 3,600 CHP bet, the players call and re-raise each other until everyone is all-in just in time for the turn card to be dealt. The turn brought a lucky straight for Tony, as well as a flush draw to eliminate a few outs from his opponents. While our advisor was in the position to take the biggest pot in CoinPoker history, he still needed to avoid pairing the board. However, ennuye filled up his full house with a lucky 2 on the river. The final card resulting in a massive 2,189,160 CHP win for him. Publicity stunt? I hope the marketing funds lost here work as planned! so max stakes were equiv of $20/$40 , lmao. If TonyG did in fact use his own money the biggest pot that he lost were a measily $21k. The big numbers make it seem so out-there but in fact its silly babystakes and peanuts being lost here considering its just over 1c per CHP, lmao. It’s play money, so who cares? So is that why CHP value’s dropping through the floor? & What about us the reg’s who loseout when the tournament hits the bubble then freezes for hours on end. Reducing dramatically the free rolls’ prize pools when CHP is down to $0.01 is genius!!! We’re all super excited to see that a final table place is now worth a few pennies. That is certainly going to attract lots of new players and make them stick around. Thank you so much! Imagine when people realize that they could have a CHP for a penny. People will read these blogs and wish they were us now stock piling CHP. Imagine what that HAND TONYG Lost is worth in 2022… If and when it goes to $1.00 per CHP. That was a Million and a half Dollar pot. Only an idiot can lose those hand’s like that and that amount of SHITcoins! Does that mean that TonyG is an idiot? Did Tonyg bought millions of chp real money, or he just used “marketing funds” to make some “nosebleed poker”? No, he played with money they (CHP “team”) stoled from ppl. Please don’t be so blind. 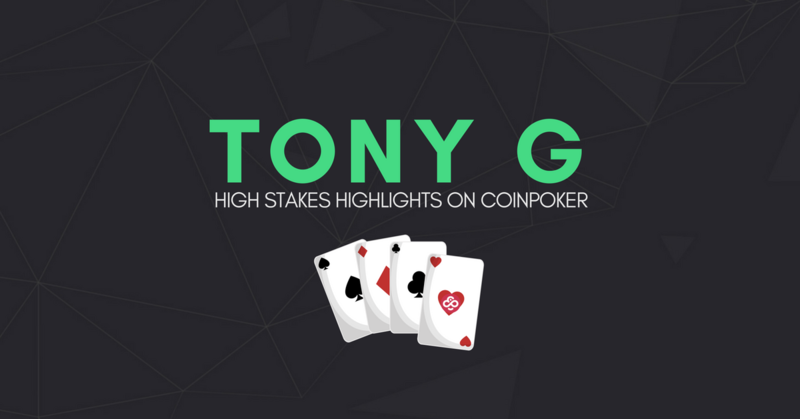 To answer your question, TonyG played with his own CHP tokens. As an advisor and fan of the platform, he decided to hit the tables in between his busy schedule with his own funds, which we were naturally excited to share with the community. Wow… This is amazing I wish I was there to watch it. $14 grand per pot is a lot of cash! Baby! I’d of rolled this 1 million 400 thousand CHP into HitBTC and cashed half out in a few weeks. I bet CHP goes to $1.00 per Chip in 2022 maybe that’s super low like when people thought Bitcoin was done for and it went to $20K a bitcoin. I had a friend who sold 23 full bitcoin he mined for $200 each. Some other horror stories i’ve heard from others. Don’t lose all your CHP. It will be valuable and we will all kick ourselves when everyone wants to buy in to big name tournaments because there is no where else anyone can play without regulation. 🙂 I agree. It doesn’t really matter where the funds came from…it has the possibility to be an epic story many years from now. There is a big picture to all of this and we should all just enjoy the journey, myself included. Good luck CoinPoker! Tony G losted more then 5 millions, and he told during the game that he is going to rebuy and they didnt get these chp from open market (so someone from team did transfer these millions to him, as internal transfer between players is capped on 10k at once… that means Tony G (team) will rebuy for penny in few months. On other way, if all these losted CHP from Tony are from promotional part… even that its most stupid way to lose them… as for that amount of CHP they could pay agents to bring new players to site. Eth/chp button is with 20% exchange fee minimum, sometimes it is going up to 40% from regular open market price. These fish players which buy on that way are so perfect for open market as they would push price of chp up, but instead of that, team got eth, and once chp fall vs eth (obv as part of chp are bought on this way, so open market got huge deficit) they do rebuy for fx 50-60% of eth, and eth stays to them as earnings. White paper which you can see on their site, and roadmap on it is so out dated. Maaany players from telegram group asked for sng type of games, they cant implement them in all these months… they got only few developers as it seems, so every idea is “forwarded” to them, but most of them end in trash for now. Btw, team got nearly 50m$ on ico… and even near that, they are doing such a huge mistakes…. but seems they doesnt care enough… they was able to get much more developers for that money to get everything done on time… but classic business as it seems. I am still big holder of chp, but I just dont care anymore, this is more important to say truth at this moment then money which I did earn there! Next Post Announcing the CoinPoker Hand Off Winners!